Georgian Bay Airways Ltd., Parry Sound, Ontario. Information, Photos and Reviews. 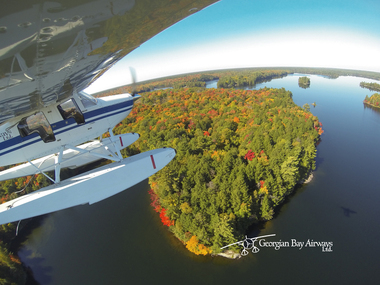 Operating from May through October out of Parry Sound’s beautiful downtown waterfront in the heart of the 30,000 Islands, Georgian Bay Airways Ltd. proudly offers a modern fleet of seaplanes to service your flying needs. Sightseeing Air Tours, our signature “Fly & Dine” to World Famous Henry’s Fish Restaurant, Charters, and Flying Adventures are just a sample of the Georgian Bay Airways experience. For aspiring bush pilots, you’ll find our floatplane training to be first class. We challenge you to find a more thorough seaplane training facility in Canada! Gift certificates and bookings are always available by phone or email. Visit us at the Town Docks and enjoy an ice cream cone or speciality coffee while watching floatplanes land and depart in the busy harbour. Nobody has reviewed Georgian Bay Airways Ltd. yet, Be the first. You are submitting a booking enquiry. Georgian Bay Airways Ltd. will then contact you by email with details of availability and prices.